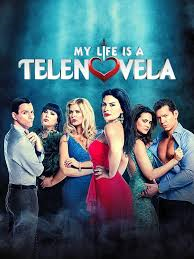 My Life is a Telenovela (WE) Rated TV-14 | What to Watch. A reality docu-series that follows stars of Telenovela shows. Starring Sissi Fleitas, Gustavo Pedraza, Raquenel, Liliana Rodriguez, Enrique Sapene. This show is an interesting reality show that has the stars of Telenovela shows. The film it like a Telenovela but has the fights and back stabbing that Telenovela’s have as well as reality shows. I do question how awful they are to each other. I really hope that part is more scripted in the unscripted way and not that they actually do those things to each other. Its fun to see the behind the scenes of a Telenovela let a lone a tv series as you see in this reality show. The show is interesting but not really my cup of tea, making this show worth a check out. This entry was posted in 2016, Rated TV-14, reality tv, reviews, Tv shows, WE and tagged docu-series, Enrique Sapene, film, Gustavo Pedraza, Liliana Rodriguez, My Life is a Telenovela, Raquenel, reality, reality show, scenes, scripted, show, Sissi Fleitas, stars, Telenovela, telenovela shows, trailer, TV series, unscripted, WE, We TV, worth. Bookmark the permalink.